The best-known way to fray a pair of cutoff jean is to put them through cycles in the washing machine and dryer. 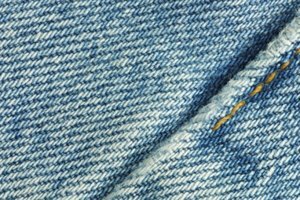 Depending on how much you want your shorts frayed, this process is time-consuming and a costly waste of energy. Be more earth-friendly and use elbow grease instead of electricity to fray your cutoffs. It will still be time-consuming, but your efforts will be worth it. In the end the jeans will look like a pair of expensive designer cutoffs. Lay your jeans down on a flat surface. Lay your shorts on top of your jeans. Match up the crotch of the pairs of pants. Use the chalk to draw a line on your jeans at the edge of the shorts. Remove the shorts on top of your jeans and use your scissors to cut off the legs of your jeans at the chalk line. Cut through both layers of fabric on each leg simultaneously. Run the sharp edge of one scissors blade across the edge of the shorts in one direction to release vertical threads. Take your scissors and very carefully separate the horizontal threads at the bottom of your new cutoffs from the rest of the shorts. Use the point and edge of the scissors to help separate out the threads. This is the time-consuming part of this project. The more threads you pull away from the shorts, the more they will become frayed and the easier it will be to fray them further. Distress and fray the leg portion of your cutoffs using the X-ACTO knife. Score only the top layer of fabric using small diagonal cuts. Then score diagonally in the opposite direction over your original score marks. The more you do this, the more you will release the horizontal threads of denim. Use the knife and your fingertips to separate out the threads and create distressed sections of jeans.